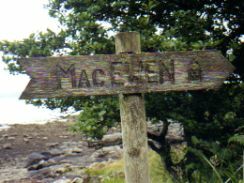 We too are part of Clan MacEwen, but we are original spellers so we are the McQuown family... still same pronounciation. We came from Scotland to Virginia to western Kentucky (Bardstown where my great great grandfather was the sheriff) to central Illinois where we stopped. there are so many variations of the name, who can say they are original?the clan name was originally Eoghainn, which in todays language is Ewen.when translated through hebrew it means john,Mac means 'son of'. my brother,dad,grandad and so are named john, so when put together speaks,john son of john.as u can see my surname is mcEwen,one of two of the closest variations of the the original spelling.